[UPDATED OCTOBER 2015] Chlorhexidine, a low-cost antiseptic, prevents deadly infections that enter an infant’s body through a newly cut umbilical cord. Few other interventions have as much promise to rapidly reduce newborn deaths at an affordable price—less than $1 per dose. Chlorhexidine has no toxicity risks and virtually no potential for misuse. It has a long shelf life, requires no cold chain, and is extremely easy to apply with minimal training and no equipment. These factors make it suitable for hospital, health center, and home care alike. Few other interventions have demonstrated such potential for rapidly reducing newborn mortality across so many settings for such a low cost. In July 2013, the World Health Organization included 7.1% chlorhexidine digluconate (delivering 4% chlorhexidine) for umbilical cord care on the WHO Model List of Essential Medicines for Children. In October 2013, WHO issued new guidelines for umbilical cord care that recommend daily application of 7.1% chlorhexidine digluconate to the umbilical cord stump for the first week of life in areas with high neonatal mortality. Millions of mothers and health providers around the world continue to have a strong desire to apply something to the umbilical cord stump, and putting nothing on the cord stump is simply unacceptable in some cultures or communities. In the absence of a specifically recommended product, they use a variety of traditional and non-traditional substances, including breast milk, cooking and motor oil, dried cow dung, ash, alcohol, traditional herbs, salty water, mustard seed oil, turmeric, antibacterial ointments, and numerous other preparations. In this installment of "Trending Topics" the Health COMpass presents several communication tools and project examples designed to promote and explain the use of chlorhexidine to reduce newborn mortality. This Implementation Kit (I-Kit) is a step-by-step guide to developing communication strategies to increase demand for the 13 underutilized commodities identified by the UN Commission on Life-Saving Commodities. The primary audience for these guidelines is health professionals who are responsible for providing postnatal care to women and newborns, primarily in areas where resources are limited. This toolkit provides information about the UN Commission on Life-Saving Commodities for Women and Children (the Commodities Commission), its 13 priority commodities, and examples of how its ten recommendations to improve access and availability are being applied globally and within countries. This is a film for health workers and communities providing safe newborn care. The film demonstrates how to effectively use chlorhexidine to provide safe umbilical cord care after birth. 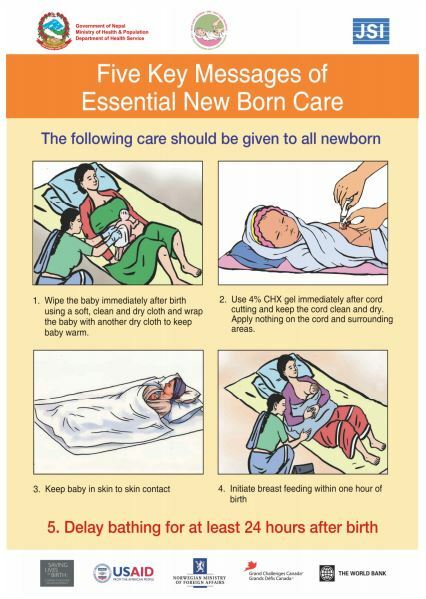 This poster illustrates how to apply chlorhexidine gel to the umbilical cord after delivery to prevent infection. It explains how to apply the gel and how to care for the cord afterwards. This poster illusrates and describes the proper procedure for application of Chlorhexidrine to the baby's umbilical cord immediately after birth so as to prevent infection. This is a training curriculum for service providers in Nepal, as they learn about the use of chlorhexidine to reduce neonatal mortality. This poster demonstrates the proper way to use Chlorhexidine digluconate -- a gel for umbilical cord care in newborns.